59 Grand Banks Motor Yacht for Sale "Indulgence"
Performance and luxury, form and function come together in perfect harmony aboard the Grand Banks 59 Aleutian RP. With a modified deepV hull and power options up to twin 1,000 hp diesels, the 59 RP cruises to 25 knots and beyond without ever sacrificing steady, quiet comfort. Pilot from the lower helm and enjoy sweeping visibility, or from the flybridge, where ample seating and panoramic views create an irresistible setting for your family and friends. 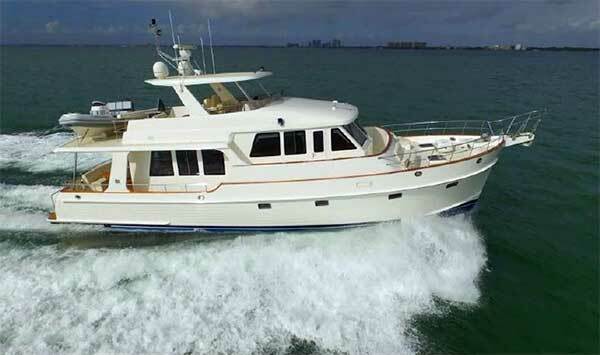 Inside and out, the 59 RP impresses with its timeless style, intelligent design, and luxurious amenities. Designed in collaboration with renowned naval architects Sparkman and Stephens, and packed stem to stern with thoughtfully appointed features, the 59 RP represents the Grand Banks cruising experience at its finest.